Well, here we go, it is 3am, July 5th; I woke at 1am about half an hour before our scheduled wakeup call and looked outside and we had stars overhead. This was a big deal and very encouraging because yesterday for Betsy’s birthday, and our rest day prior the summit, we had nothing but sloppy rain, mixed with snow, and cloud cover. We will see how we do today. The snow cat has pulled up; we are going to take snow cat up to get our start. Everybody has their crampons on and they will be crawling on the snow cat wearing their crampons. We’ve spent a great deal of time yesterday getting ourselves lined up, suited up, and ready for this climb. Getting our gear checklist done. This morning we came in and had our breakfast at 2, wonderful breakfast prepared by Leila and then we got suited up. We are wearing our full on mountain clothes because when we step up that snow cat we will be at quite high altitude. 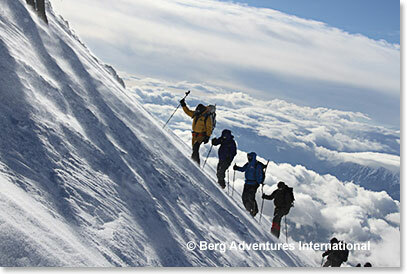 Here we go our attempt to climb Mount Elbrus. Vicious and delicious is under way. Complete success on Mount Elbrus today. 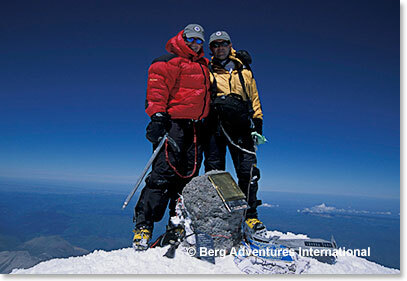 At 9:20am, Three Vicious and Delicious couples: Dale and Betsy, Barry and Jean, Todd and Sue along with four Berg Adventures guides stood on the very summit of Mount Elbrus. And it is still hot folks, I can’t believe it, I have never seen it like this. We had a forecast for bad weather all week and indeed we have seen some clouds, rain, and snow. But it seems like when we are hiking or climbing, the skies are beautiful, and they were today, it was perfectly clear on Elbrus. As you know from my previous dispatch, we got on the snow cat at 3, we are off the snow cat and climbing at 4am and we did really well getting to the summit in those 5 hours and 20 minutes from when we left the snow cat. Really successful day, I’ve got a tired team down here. We are back at the barrels now and we are getting ready to have a soup and lunch with Leila. I think some naps are probably in order for the vicious and delicious team for the rest of the day. From the Barrels, signing off. 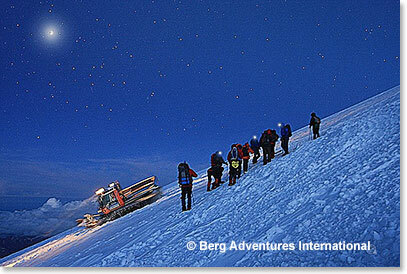 We had great summit success on Mount Elbrus.